Our most popular oil, Lavender has been cherished for its unmistakable aroma and its beneficial properties for thousands of years. Lavender is widely used and accepted for its calming and relaxing qualities. * Lavandula angustifolia. For aromatic, topical, or dietary use. 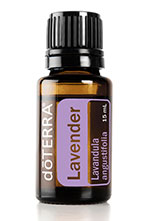 Add a few drops of Lavender to pillows, bedding, or bottoms of feet at bedtime. Keep a bottle of Lavender on hand to soothe occasional skin irritations. Freshen your linen closet, mattress, car, or the air by combining Lavender with water in a spray bottle. Diffusion: Use three to four drops in the diffuser of your choice. Internal use: Dilute one drop in 4 fl. oz. of liquid. Topical use: Apply one to two drops to desired area. Dilute with doTERRA Fractionated Coconut Oil to minimize any skin sensitivity. See additional precautions below.